I don’t cook mussels at home often enough. But, I did this past Friday. It was glorious. Elegant, affordable, readily available, and a breeze to make. From the fridge to dinner table, the mussels are ready to devour in just 20 minutes. I paired this batch with white wine, garlic, parsley and lemon. Obviously, I had some good bread to soak up the broth. Buying: When you’re at the fish market, make sure the mussels are kept over ice and that their shells are glistening with moisture. The shells should be tightly closed. The mussels should smell briny, like the ocean. Mussels are living creatures, so they will still be alive when you buy them at the store. (Don’t worry, they don’t bite) Though wild mussels are available in certain markets, the vast majority of mussels you’ll find at the market are farm-raised. Storing: Mussels are best if cooked within a few hours of purchasing. If you can’t do that, they’ll be fine for a few days in the fridge. If you need to store them, place the mussels in a large bowl. 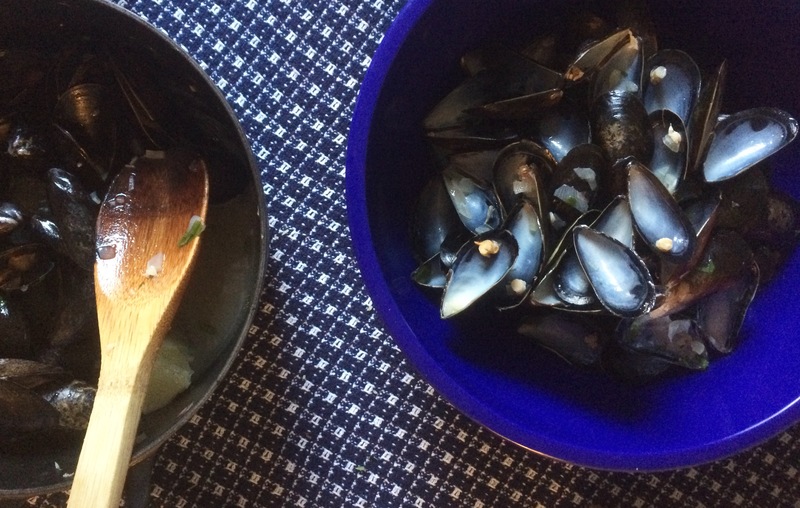 Cover the bowl with a damp paper towel to keep the mussels protected and moist, and store in the fridge. The mussels need to breathe, so don’t store them in an airtight container or in water. Cleaning: Mussels attach themselves to stable surfaces using thin sticky membranes referred to as “beards.” Most farm-raised mussels will come debearded, but odds are good you’ll find a couple of stubborn beards left over. Look for a group of short brown strings coming out on one side of the mussel where the two halves of the shell close. This is the “beard.” Grip these strings with your fingers and tug gently from side to side. As you tug, the strings will pull out and detach from the shell. If you have trouble gripping the beard with your fingers, a dry paper towel usually does the trick. 4 pounds mussels. Prince Edward Island (PEI) are my favorite. Rinse the mussels in a strainer and check them over. If you feel any muddy spots, rub under running water to remove. All the mussels should be tightly closed. Discard any mussels with cracked shells. If the shell is open, tap the mussel lightly against the counter. If the shell doesn’t close in a few minutes, discard the mussel. Do a quick check for beards. If any beards are still attached, remove and discard. Now you’re ready to start cooking. Warm butter and olive oil over medium high heat in a large pot. Add shallot and garlic and cook 2-3 minutes until shallot is translucent and garlic fragrant. Season with freshly cracked black pepper and a pinch of red pepper flakes. Add mussels to the pot and cook, stirring for 1 minute. Pour chicken broth and white wine over the mussels and immediately cover pot with lid. Cook, covered, for 5 minutes. 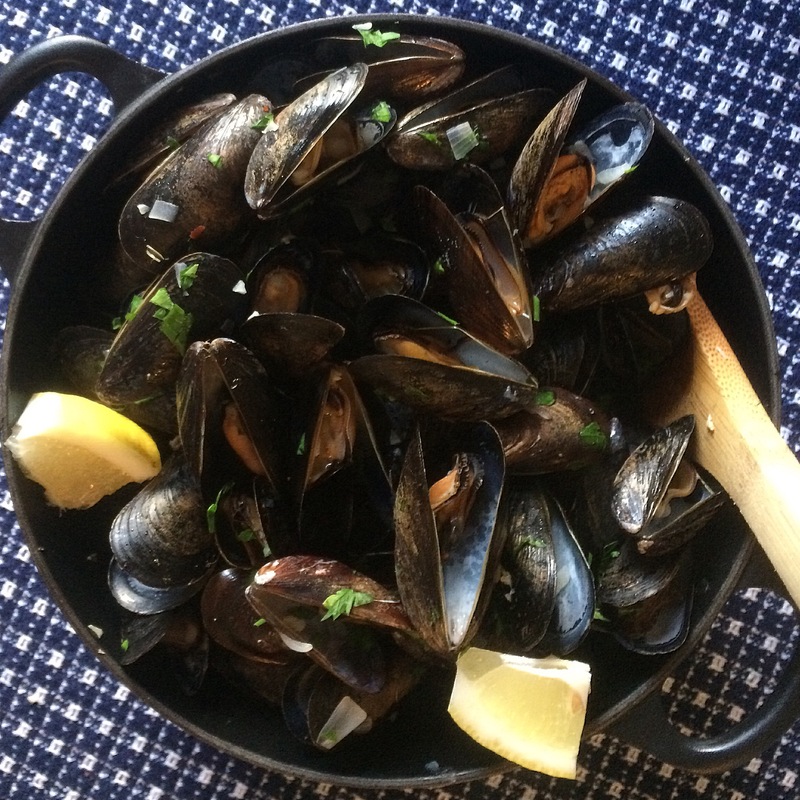 Shake the pan once or twice while cooking (with the lid on) to distribute mussels. After 5 minutes, the mussels should be fully cooked and open. If not, return the lid to the pot and cook for an additional 2 minutes. Add lemon juice and fresh parsley and give the mussels a good stir. This coats the mussels in the shallots, garlic and broth. Remove and discard any mussels that have not fully opened at this point. 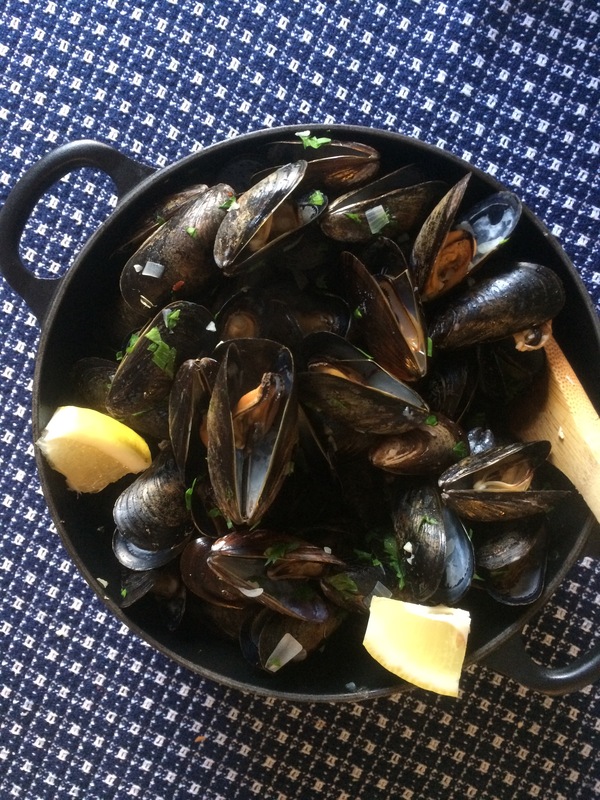 Serve mussels straight out of the pot in the middle of the table, or pour mussels and broth into 4 large bowls. Serve with extra lemon wedges, and crusty bread for mopping up the broth.